This time I am introducing Yufuin-cho Oita Prefecture located in the northeastern part of Kyushu. Yufuin is easy to access in the distance from Fukuoka prefecture only a few hours. It is easy to see the sights in a small but cozy town and nowadays many tourists from both domestic and overseas visit Yufuin. Speaking of hot springs in Japan, Yufuin is a hot spring resort where its name always comes out. Yufuin town is next to Beppu (別府) which is also a popular hot spring resort. Because there are many sources of hot springs and the amount of hot spring water is plentiful, there are many inns with hot spring facility in the town as well. Since there is no big commercial facility and building, the town itself is small but cozy and easy to stroll and can enjoy sightseeing leisurely. By the way, “由布院” and “湯布院” both read the same “Yufuin”, both of which are correct answers. There are various ways to access Yufuin. I used the express bus “Yufuin-go ゆふいん号” connecting Fukuoka and Yufuin station. For more information about express bus, please check this link. On this linked site you can purchase tickets with regular rates from Fukuoka to Yufuin station. The bus fare of between Fukuoka and Yufuin by Nishitetsu express bus is 2880 yen. Nishitetsu Express Bus sells tickets for regular trips as well as discounted round-trip tickets, and coupon tickets (four tickets for the express bus). If you would like to purchase a coupon ticket, please check this link and there is a phone number of Kyushu Express Bus Reservation Center on the bottom of the page. The website is in Japanese and I’m not sure if they can accept other languages. I purchased the discounted four tickets this time as my friend and I used the bus for round trip. Let’s get started to introduce the trip of Yufuin. Unfortunately, this day was suffering from a raging rain, so we headed to the hotel first to put our luggage. 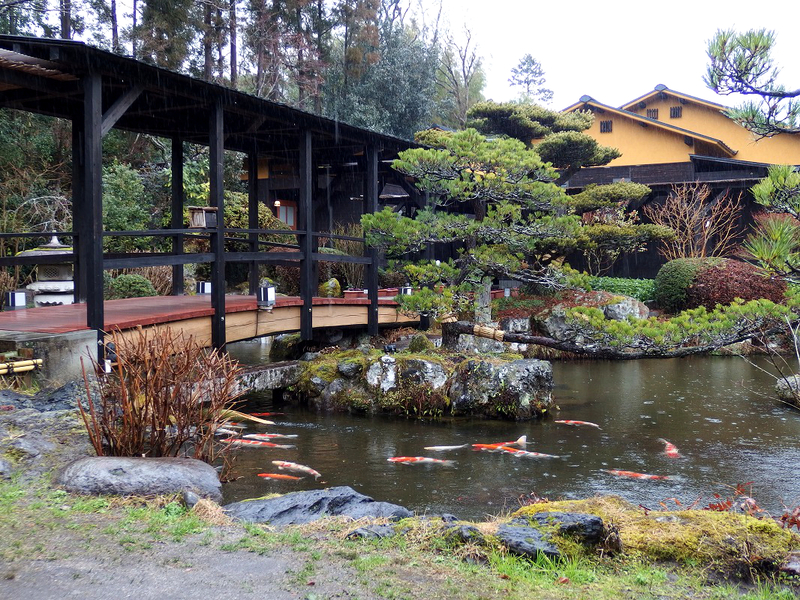 The photo below is the garden of the Yadoya Ohashi where we stayed a night. There was a beautiful garden in this Ryokan (Ryokan = 旅館: Japanese traditional style of a hotel). 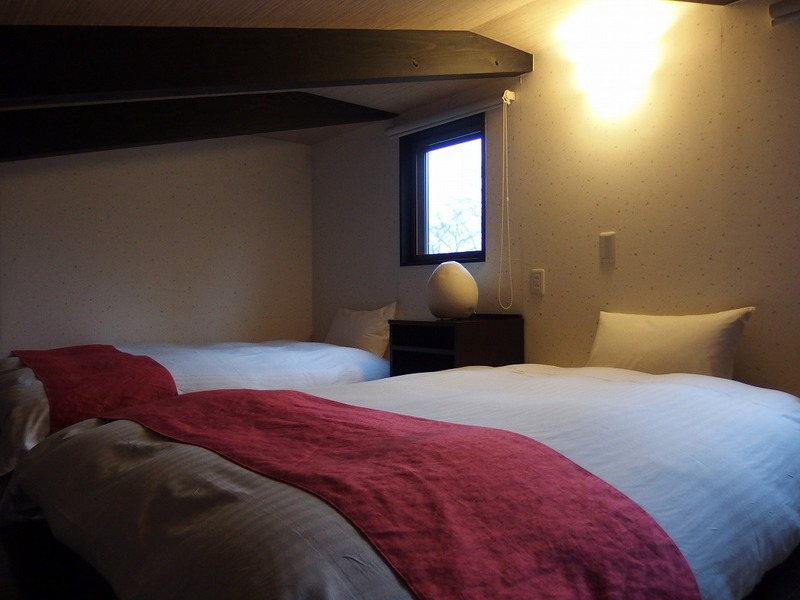 This time we stayed a room with an attic room and that was 9,500 yen (per person) without a meal per night (Prices are constantly changing). This room had a private open-air bath. 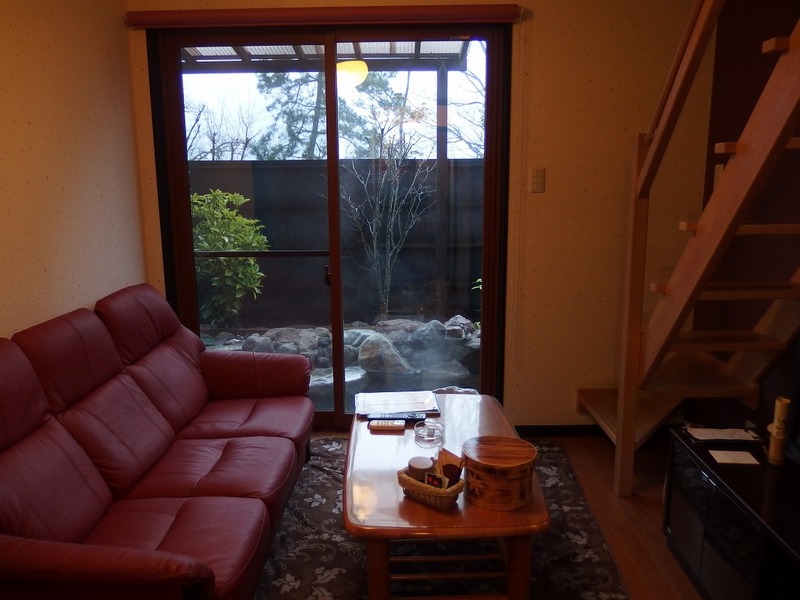 We can see the open-air bath through the window. The size of the room was about 8.2 square meters and I felt it was a little small. 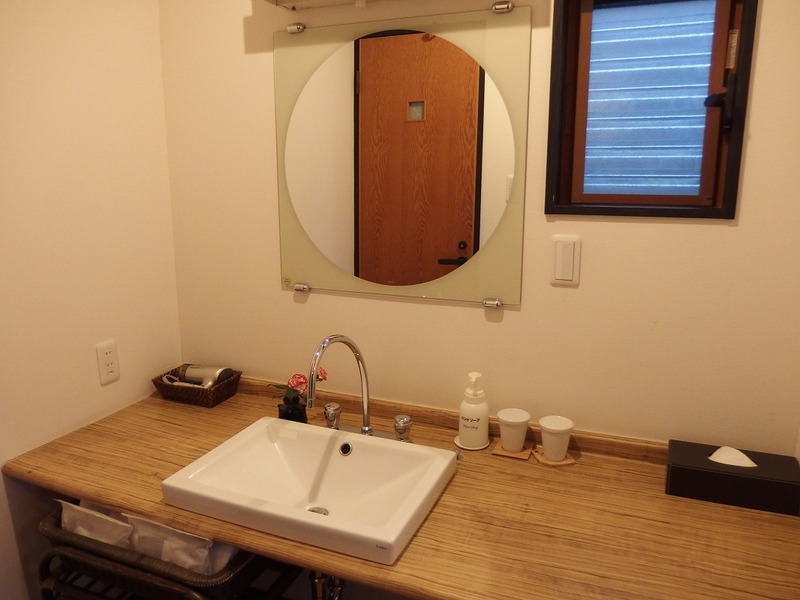 By the way, all the rooms in this ryokan are independent guest cottages with open-air bath (There are several room types). Go up the stairs and move to the attic. This space was simple but has a nice calm atmosphere. We can go to the outside through the dressing room next to the entrance. It also had an indoor bath. This is the open-air bath. 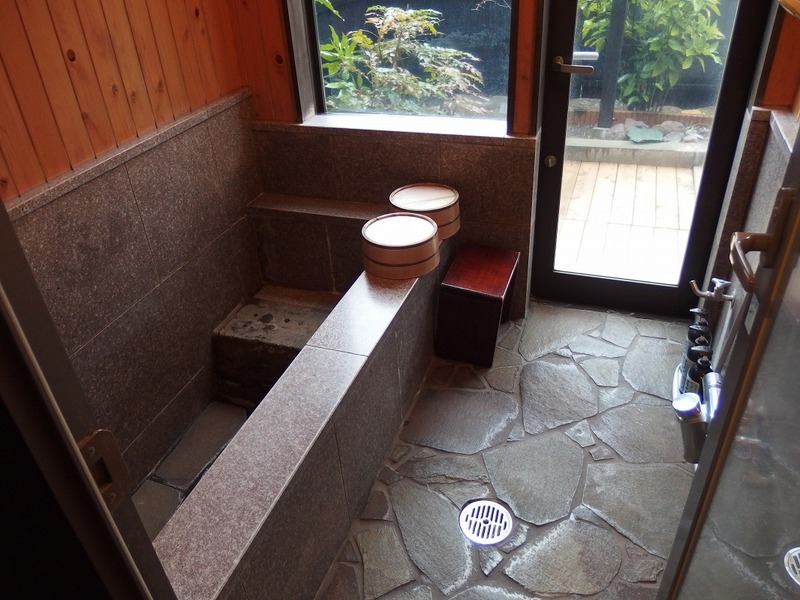 Because it is a private bath, you can enjoy Yufuin hot spring whenever you like. 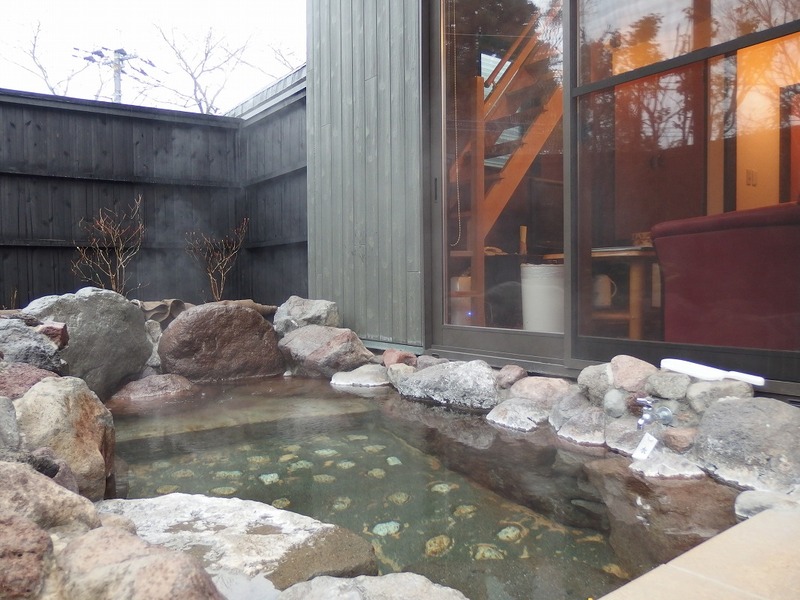 It has long been considered that hot springs have an effect of healing injuries and diseases in Japan. There are various kinds of hot springs, and it is classified by the hot spring water’s quality. Nowadays, hot spring water is scientifically investigated and we often see that each hot spring resort posts the name of the hot spring water on the wall. Because the name of the hot spring water is determined by the kind and content of the chemical ingredient, the name is not to be attached when it does not reach the standard. 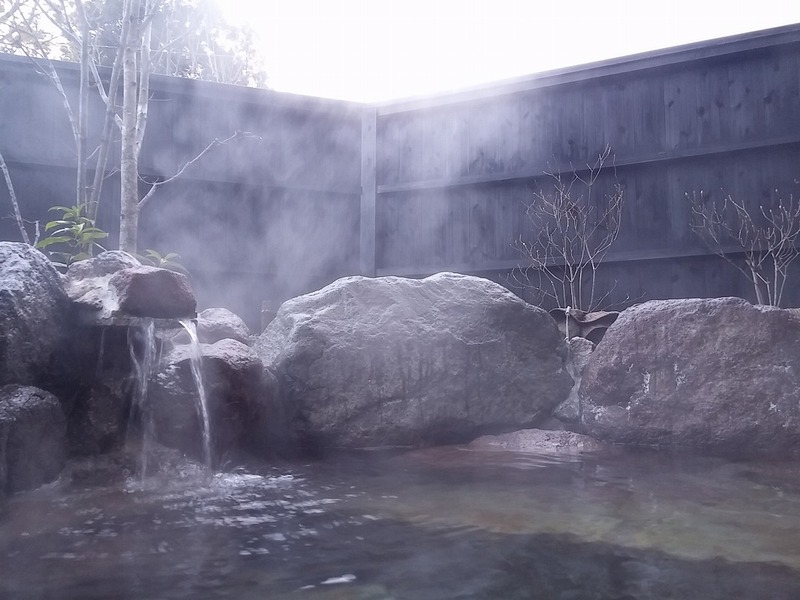 By the way, type of hot spring water of Yufuin hot spring is the “simple hot spring (単純温泉)”, and Ureshino hot spring introduced before is the “hydrogen carbonate spring (炭酸水素塩泉)”. There are ten kinds of hot spring springs in total including these two. We only had a little stroll around the town and then went to the BBQ restaurant “Shichirinyaki-Wasaku” for the dinner. 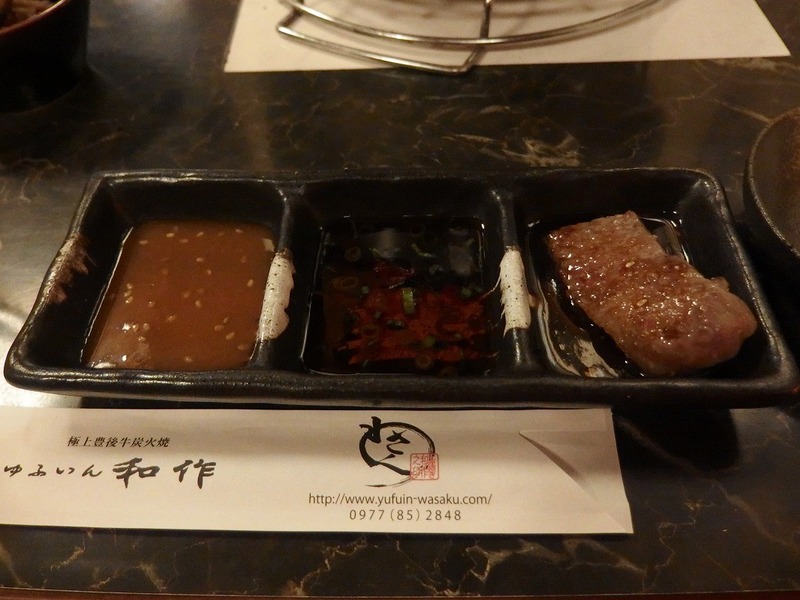 Wasaku is a popular restaurant with many guests even from overseas. 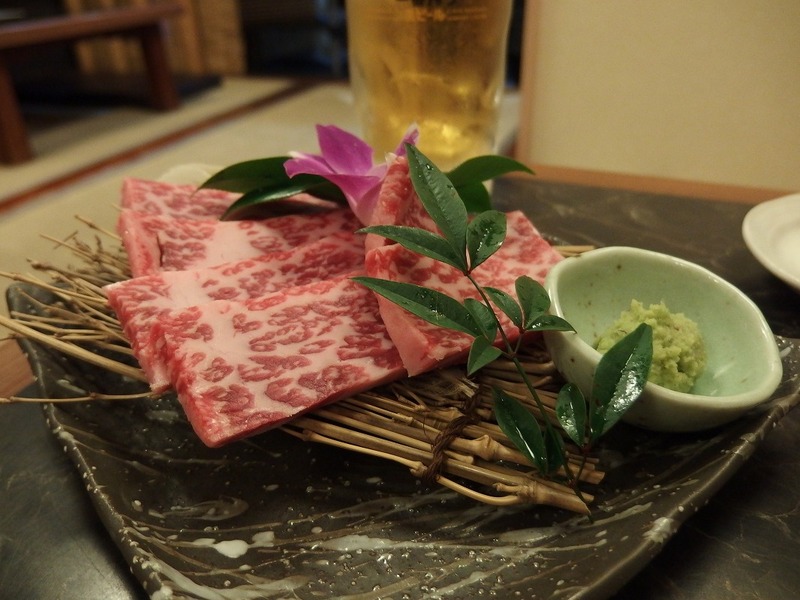 All ingredients are selected carefully and splendid, but especially recommendation is Bungo beef (豊後牛) of Oita. 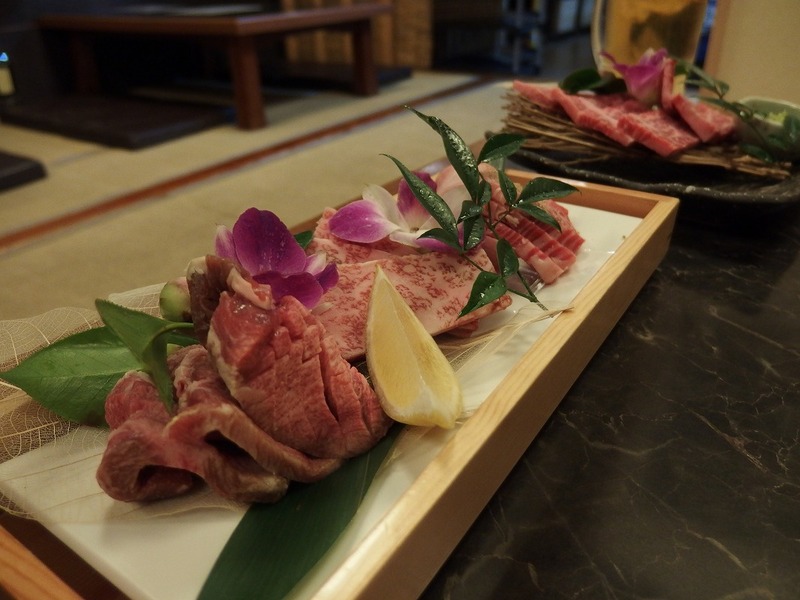 Bungo beef is high-class beef from Oita Prefecture and we can enjoy this grilled beef at Wasaku. 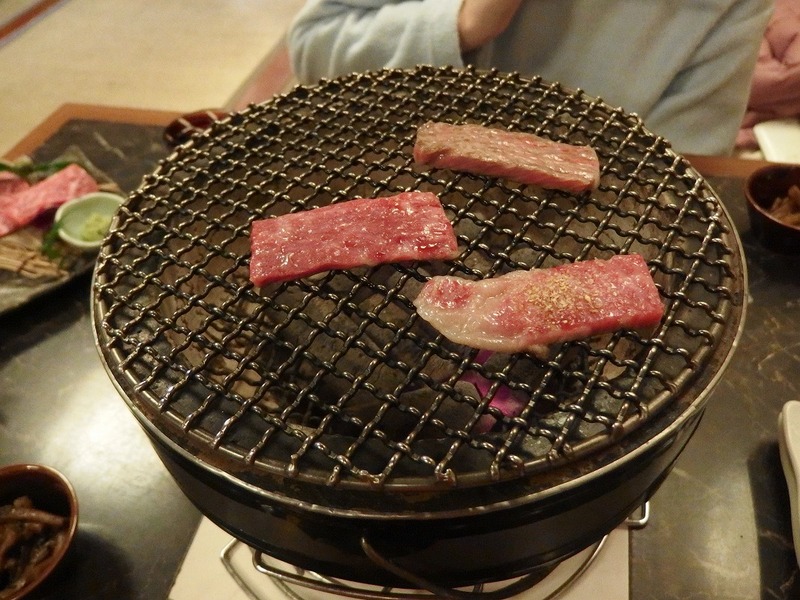 Grill the meat on this cooking stove called “Shichirin 七輪”. Shichirin is a cooking stove that uses charcoal or coal briquettes as fuel. Since it can be utilized not only for cooking but also as a heater, it was used in each family in old Japan. About the earthquake in Oita, Yufuin. 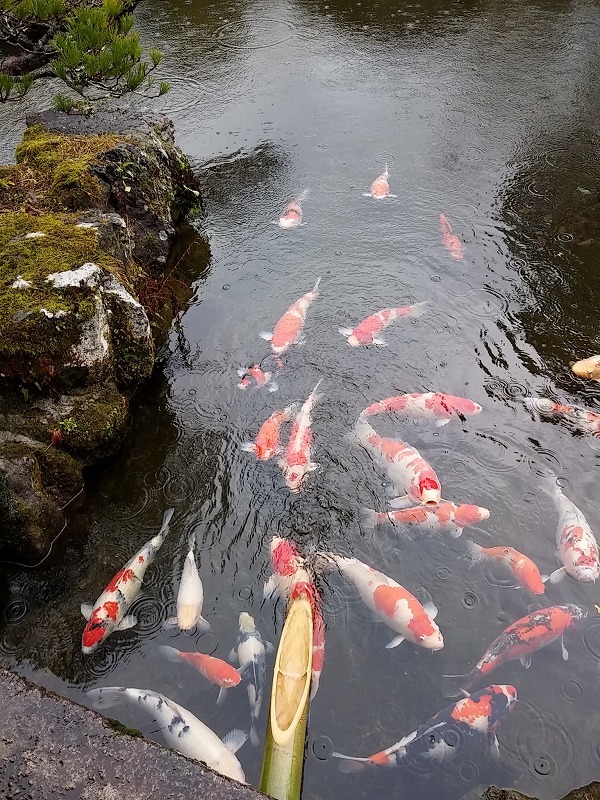 This article is about the Yufuin trip that I visited in January 2016. Due to the earthquake in Kumamoto Prefecture and Oita Prefecture that occurred last April, Yufuin was also damaged. 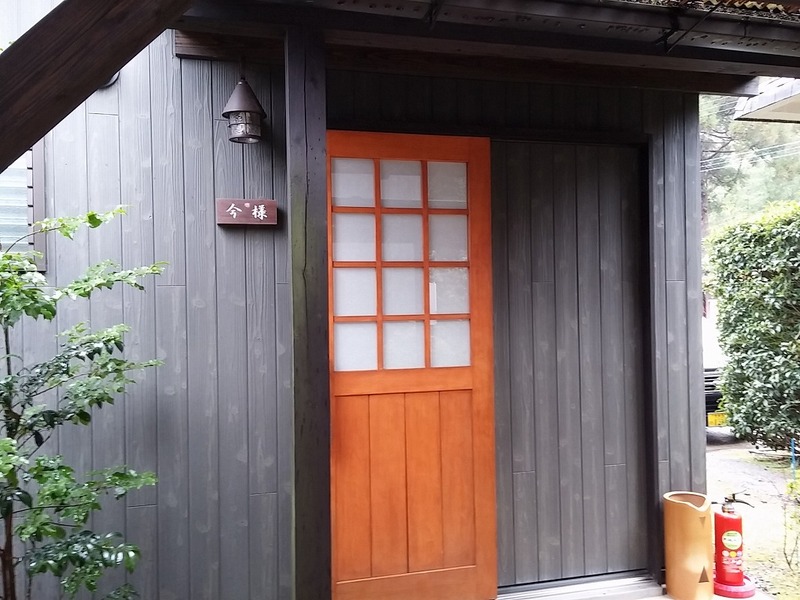 I was looking for a right time to write about this trip and recently, I have heard most of the accommodations in Yufuin have been resuming business. It was said that the number of customers seemed to fade away due to the influence of the earthquake, so I wrote this article as the meaning of rooting for Yufuin as well. Yufuin Station Address: Kawakita 8-2, Yufuin-cho, Yufu-shi, Oita. Access: You can take a limited express train or a bullet train from JR Hakata station, but using an express bus is cheaper. 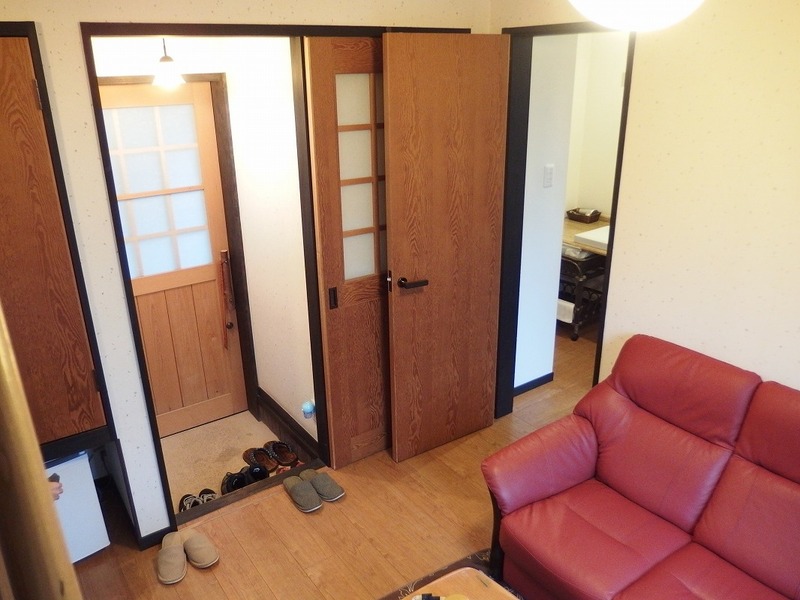 Address: Kawakita 1235, Yufuin-cho, Yufu-shi, Oita. Access: Walk straight on the main street from Yufuin station. It takes about 3 min and you will find it on your left side. Nagahama Ramen is here! Ganso Nagahamaya (元祖長浜屋) Tonkotsu Ramen! ← No longer necessary to eat out? A way to get fresh seafood cheaply in Japan. Extremely cheap discount store “Direx”.